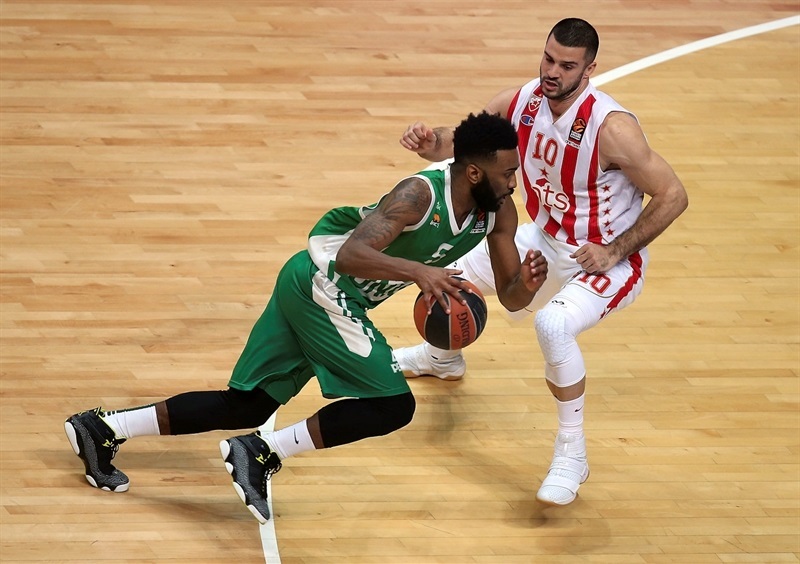 In a thriller that came down to the final seconds, Unics Kazan grabbed its second win in the 2016-17 Turkish Airlines EuroLeague by edging Crvena Zvezda mts Belgrade 65-62 at home on Thursday. Both teams now have 2-4 regular season records. 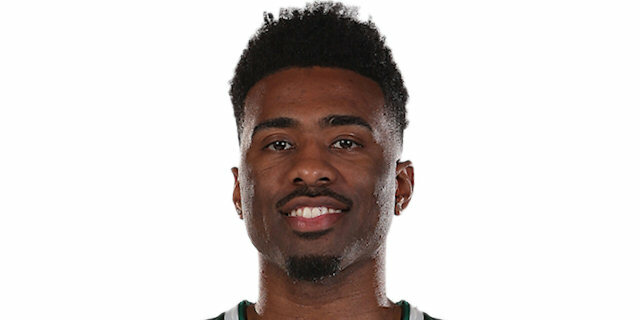 Keith Langford led the winners with 23 points, including the go-ahead three-pointer with 17 seconds left that capped his team’s comeback from a 9-point deficit in the final four minutes. 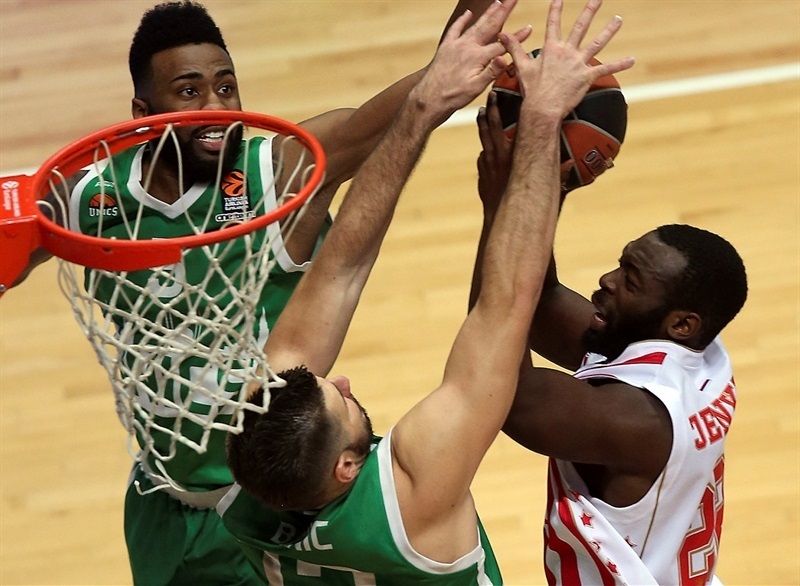 Latavious Williams and Marko Banic each had 10 points for Unics. Nate Wolters led Zvezda with 11 points while Ognjen Kuzmic had 10. 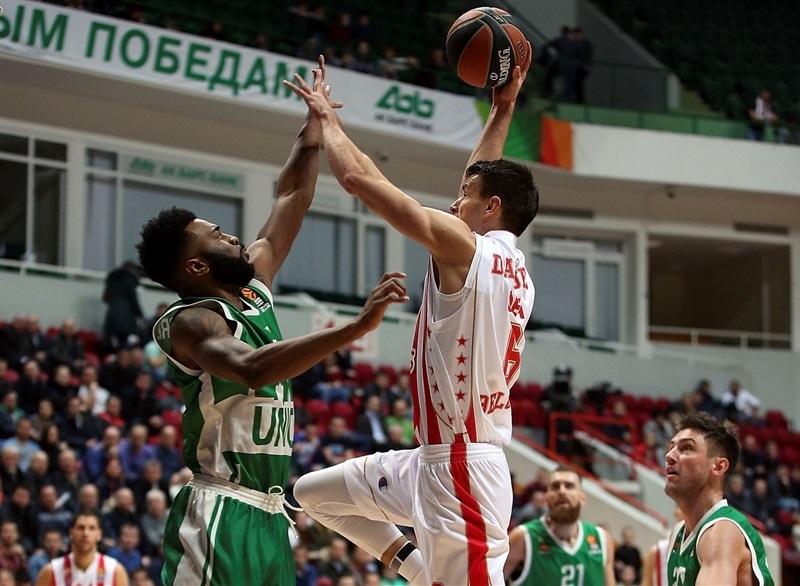 Zvezda dished 9 assists before halftime and forced Unics into poor shooting percentages – 7 of 22 (31.8%) two-point shots and 1 of 7 from three-point range (14.3%). Unics improved in the second half and ended up outrebounding its opponent 35-28, limiting turnovers to just 8 and hitting 22 of 25 free throws. 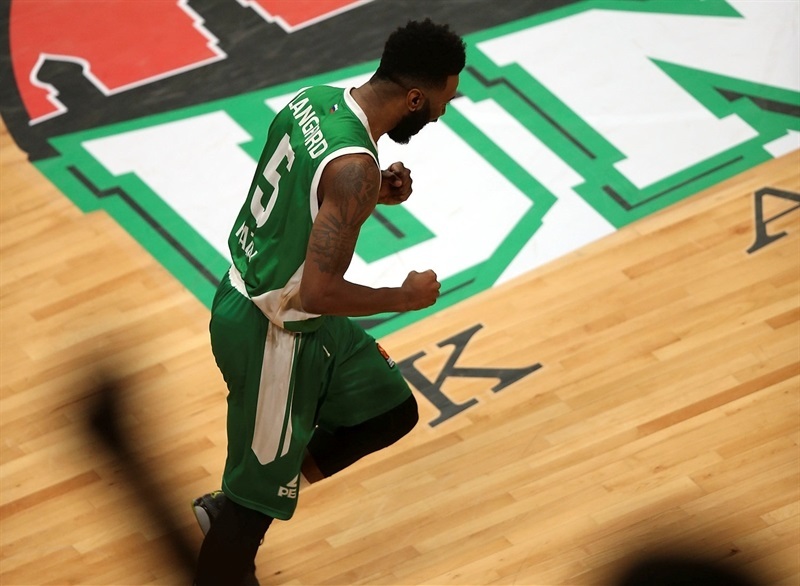 That allowed Unics to get back in the game - Langford had 9 points in a final 13-2 run, which helped Unics add its first home win of the season. A fadeaway jumper by Quino Colom and a driving layup by Langford gave Unics an early 6-3 lead. Nemanja Dangubic struck from downtown to ignite a 0-7 run, which Luka Mitrovic capped with a reverse layup for a 6-10 Zvezda edge. Unics looked to its second unit, as Banic and Orlando Johnson helped the hosts regain the lead, 15-13. Kuzmic scored down low and Mitrovic dunked, but a buzzer-beating floater by Williams tied it at 17-17 after 10 minutes. A corner triple by Dangubic gave Zvezda the lead, 21-22, early in the second quarter. Langford fed Williams for an alley-oop dunk and scored in penetration for a 25-24 Unics lead. Milko Bjelica and Wolters rescued Zvezda with consecutive baskets and Marko Simonovic struck from downtown to put the guests in charge, 27-32, at halftime. A wild reverse layup by Mitrovic made it a double-digit game soon after the break. 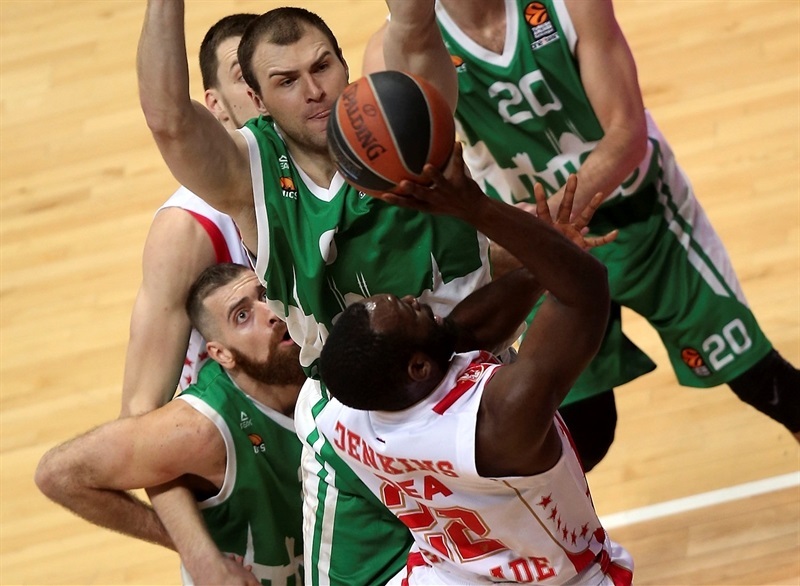 Banic and Langford stepped up for Unics and a put-back layup by Vadim Panin caused Zvezda to call timeout at 38-42. Free throws by Evgeny Voronov brought Unics even closer, 41-43, after 30 minutes. 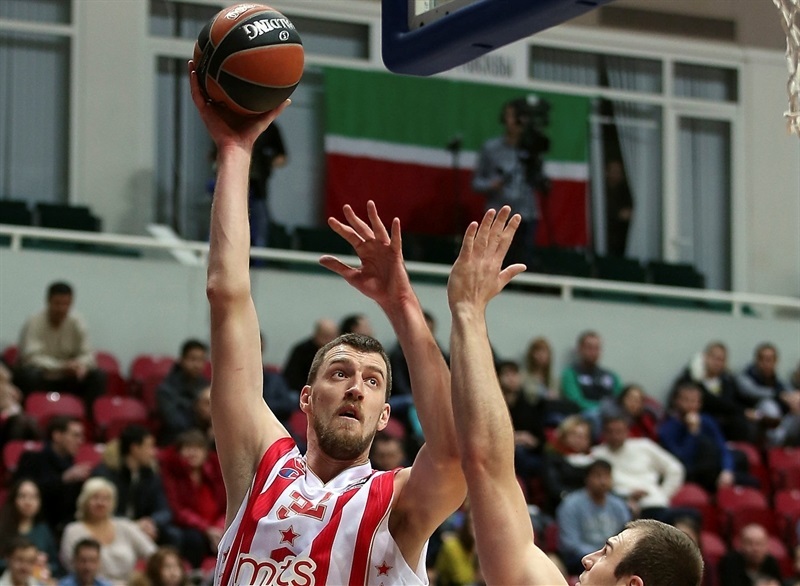 Simonovic nailed a triple and Marko Guduric added a layup in transition to give Zvezda some fresh air at 45-50. Charles Jenkins took over with consecutive jumpers and Simonovic banked in a three-pointer that boosted the guests' lead to 49-58 with four minutes left. 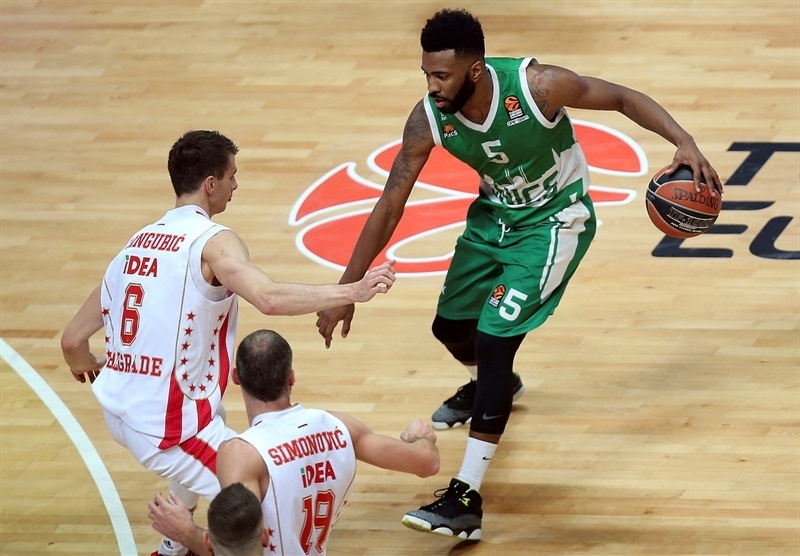 Langford kept pacing Unics and a layup by Banic gave Unics hope, 56-60. Zvezda kept struggling to score and free throws by Langford tied the game, 60-60, with 58 seconds to go. Wolters made foul shots, but a three-pointer by Langford completed the hosts' comeback, 63-62, with 17 seconds left. Zvezda had a chance to win the game, but Jenkins missed a one-handed floater and Banic rounded out Unics's win with free throws. "First of all, I want to congratulate our team, our guys, for putting a lot of heart and effort on the court, and also to our crowd for supporting us all the way. 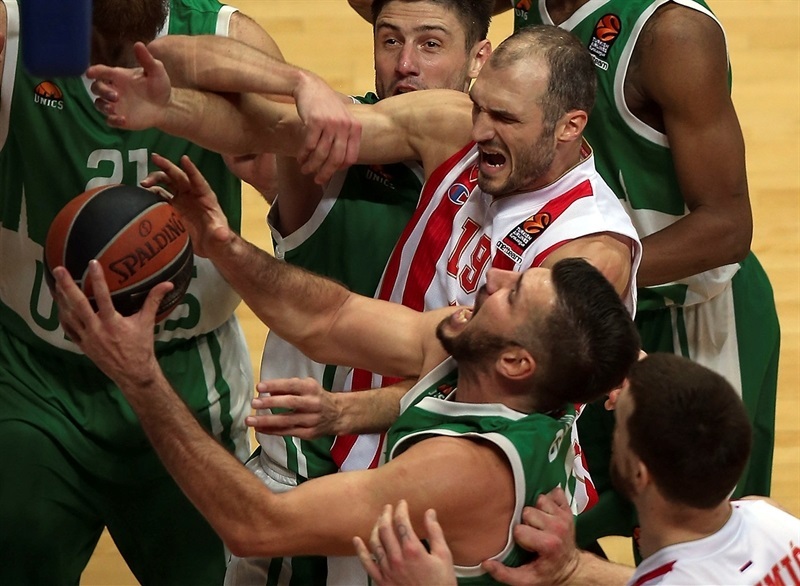 The EuroLeague is not an easy competition, every team has a deep roster, great physicality and fights until the end. Every game is like a small final, like a small new life, and you have to be prepared for every new game and fight like we did in the fourth quarter. Like Keith [Langford], Evgeny Voronov and Vadim Panin helped us a lot, but also Latavious Williams, Keith... Marko Banic came in for two, three minutes in the end and he was really aggressive. Nobody gave up and that lineup got five, six stops in a row. Defense gave us confidence and we started to get more space on offense, and that is when Keith found good shots, because everybody was helping him on the floor. One more time, we won because our guys played great and put their best effort on the floor, and this is the most important thing. We have a good roster. We have to believe in ourselves, work hard in practice and keep moving in the right direction." "Congratulations to Unics for the win. We played very good defense and that gave us a chance to win tonight. We felt good on defense except for couple minutes in the fourth quarter. They scored some very important shots in the last minutes and scored very important free throws. We played excellent against all teams in the EuroLeague. We played very good defense during the game, but it is the same score. It’s experience. We had the idea of slowing down the game." "Coming into the game, we knew that it was going to be difficult. We know that these guys are tough and they controlled the tempo of the game. They are a very good defensive team and the thing that I tried to focus on is continuing to be aggressive throughout the game. I think that, in the end, Coach gave me a rest at the end of the third quarter and at the start of the fourth. I went to the sidelines, gathered my thoughts and told myself that when I got back in, I was going to leave it all out there. Another good point about today is that when we needed stops defensively, we were able to get them. 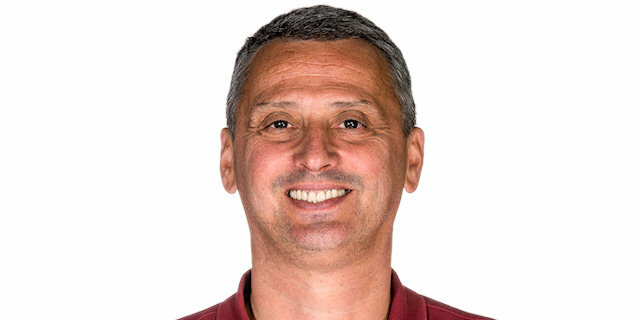 Also, we have to give a lot of credit to Evgeny Voronov and Vadim Panin; without their effort defensively, it would have been impossible to win the game."